Product categories of Mercedes-Benz Android Navigation, we are specialized manufacturers from China, Mercedes-Benz Car Multimedia, Mercedes-Benz Car Multimedia System suppliers/factory, wholesale high-quality products of Mercedes-Benz Car Entertainment System R & D and manufacturing, we have the perfect after-sales service and technical support. Look forward to your cooperation! 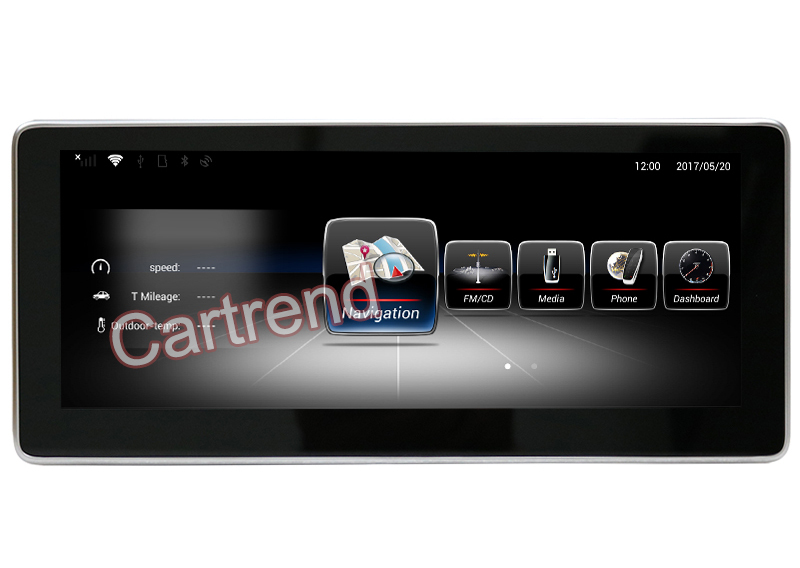 Cartrend has already developed a range of 10.25 inch Android touch screen GPS navigation player for Mercedes-Benz. The Android Benz monitor is designed to replace the factory display. By installing this new Android multimedia player, you are able to enjoy functions such as GPS navigation, internet via 3G/4G WiFi hotspot sharing, Google Play store, screen mirror link, Bluetooth hand free phone call, watching videos, listening music. What`s more, it keeps the original functions of the car like car steering wheel control. The original system is integrated in a Menu where you can switch to original interface to use the functions. The GPS navigation display uses same plugs and harness as original radio. The installation is simply plug and play without cutting original car cables. Cartend Benz Android touch screen player is compatible with Mercedes-Benz models include A class, C class, E class, CLA, GLA, GLC, GLK.